The major arcane in tarot is a journey of self, starting with The Fool. Therefore, we relate The Fool to beginnings. In today’s segment he symbolises the beginning of the year and the journey that we’ll take over the next 365 days. In this epic journey The Fool meets various energies and personalities to aid him on his quest to journey’s end. 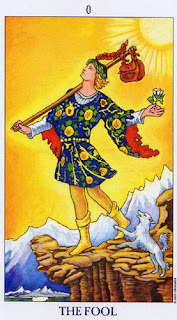 The Fool is a youthful figure, energetic and adventurous. Today we seek the inspiration of youth, filled with new ideas and brimming with readiness for the year ahead. On his journey The Fool carries with him only a modest backpack, reminding us that we too should only take with us into the new year what is necessary, leaving our old baggage behind. This is an opportunity for each of us to begin again, to leave behind patterns of behaviour and toxic energies that no longer serves us well, and to let go of unwanted hurts and pain. The Fool holds a white flower in his hand, symbolic of innocence and openness. Sinicism and bitterness are best left behind as we enter this new journey with a spirit of openness, ready to greet each new day and situation while being mindful of the gifts that they bear. Etched on the backpack that The Fool carries over his shoulder we notice the head of an eagle. An eagle can see his prey from kilometres above the ground, he has clarity of vision. Just like the eagle we too can now look ahead to see our future, as we design it, to see where the road may take us and where we are going. By now most of us have made our New Year resolutions. Let us journey towards them without unnecessary baggage and what-if’s. Instead we’ll wear our Fool cloak as we greet 2012 with an adventurous spirit. It is said that nothing ventured results nothing gained, and if we want to see a change we first need to make a change. What is it that you want to change in your life today? Perhaps you, like me, would like to shed a few kilograms, or quit smoking. Or focus on your studies, perhaps write that book that you have been thinking about writing for years. Or, perhaps it is time to rekindle old friendships and make new ones. Perhaps it is time to let go of old hurts and find it in your heart to forgive transgressions against you. Whatever you have set your resolutions and goals to be this year, consider The Fool’s approach as he begins his journey. We can all learn from the freshness that The Fool radiates as he takes his first steps on this epic journey. Let’s inject some laughter and silliness into our days ahead, let’s not take ourselves too seriously. We can rediscover the spring in our step and the song in our heart. We can smile, both outwardly and inwardly. Life is what we make of it and life is good. I’d like to wish you all a very Happy New year, and end today’s segment with a fabulous verse written by the incomparable Lon Milo DuQuette. The Fool's decree is clear.